Each month I send out a newsletter to subscribers. One section each month is devoted to Icelandic affairs. The one below is from the October 2018 newsletter. A report on the economic collapse, written in English (uhh … why? ), and entitled The 2008 Icelandic Bank Collapse: Foreign Factors, was released in October. 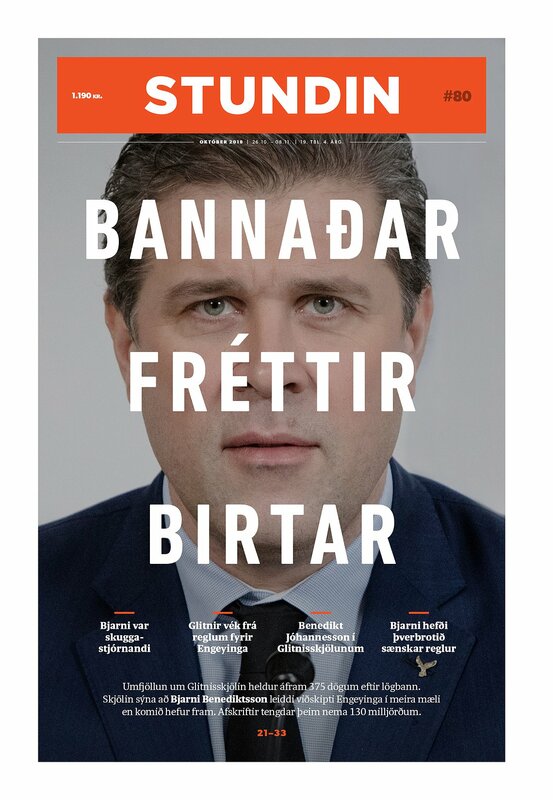 Written to commemorate the tenth anniversary of the meltdown, it took a full four years to write, and is the work of one Hannes Hólmsteinn Gissurarson, an Independence Party sycophant, doggedly loyal to Davíð Oddsson and The Party. For this stellar exposition, which predictably consists of a whitewashing of the IP and its members with respect to the collapse, as well as a treatise on the “nasty foreigners” who were so horrible to Iceland, he was paid a handsome ISK 13 million (USD 107 thousand) from the state treasury. I guess the rewriting of history does not come cheap. 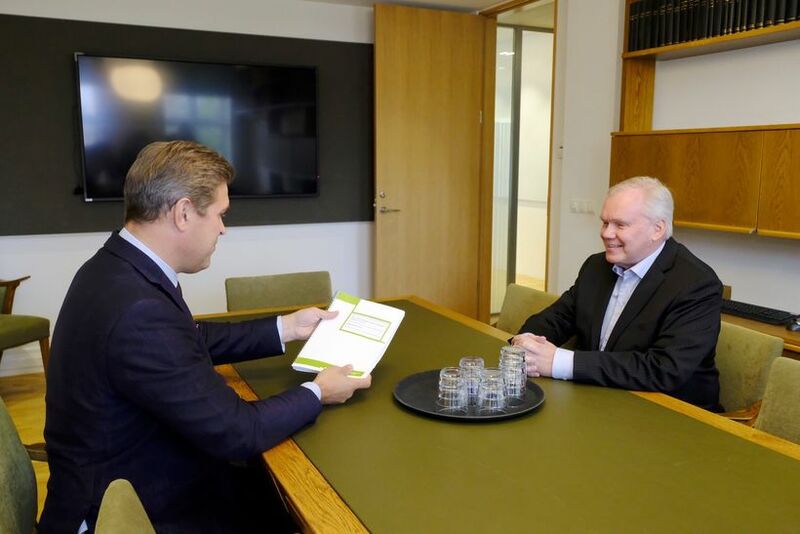 Hannes Hólmsteinn presents Bjarni Benediktsson with the whitewash report. Click for source. RÚV’s investigative news programme Kveikur broadcast a programme about the exploitation and abuse of foreign workers in Iceland. It was a deeply distressing report, and the nation was in shock afterward. I have seen comments on social media by foreigners suggesting that every Icelander must have known about the ill treatment of foreign workers, or if not, had purposely decided to avert their eyes. I cannot agree with this. I certainly had no idea things were as horrific as they apparently are, and I do not believe most people did. The matter was taken up in parliament the very next day and supervisory authorities began to make the rounds of construction sites and other places where foreign workers are in the majority. I find it hard to believe that the sort of ignominy we witnessed in the programme will be permitted to continue unchecked. The Kveikur report was released with English subtitles a few days after the Icelandic version came out. You can check it out here. The subsequent episode of Kveikur, one week later, examined where we Icelanders as a nation are today, ten years after the economic meltdown. Among others they spoke to Eva Joly, the French-Norwegian magistrate who after the collapse swept in like an angel of salvation and helped us Icelanders understand what exactly had happened, and how we had been brought to the brink of disaster by a handful of unscrupulous (or outright criminal) financial speculators, as well as incompetent politicians. While much has been made in the last decade of Iceland’s economic recovery and success in prosecuting the banksters, Joly was not of the same mind. Sure, a few people have served prison terms, yet she reminded us that the majority of the money that was shifted into offshore accounts by the aforementioned speculators (largely by robbing the banks from the inside) has not been returned. She also remarked that it is downright incredible that Bjarni Benediktsson, who was outed in the Panama Papers as having offshore accounts, and who has been involved in a wide range of financial misdealings, is currently our minister of finance, and holds the keys to the State Treasury. Speaking of, just over a year ago the independent newspaper Stundin began to report on those very misdealings – those of our minister of finance, who is also the head of the Independence Party. Their reports were based on leaked documents, and showed how Bjarni Ben, as well as his family and cronies, had used insider information to sell their shares in Glitnir bank right before it collapsed, and orchestrated a slew of other illicit financial manoeuvres. These reports were meant to be part of a series, but right after they began to appear an injunction was placed on Stundin to ban it from publishing further reports. That injunction, issued by a district magistrate that walked into Stundin’s offices and instigated a gag order without any court papers, lasted over one year. (In comparison, when Richard Nixon obtained an injunction against the New York Times to prevent it from publishing the Pentagon Papers, a court ruling was handed down within a couple of weeks to lift the ban.) In October, the Court of Appeals ruled in Stundin’s favour, something which had already been done in a district court. The plaintiff had a period of grace in which to decide whether or not to appeal the case further. When 21 days had passed from the ruling and the plaintiff was still stalling on the appeal decision, Stundin went ahead and resumed publication of its reports. What that will ultimately mean for the paper is unknown, but as yet, nothing adverse has happened. The Icelandic krona took a sharp dive this month against other currencies, devaluing by nearly ten percent against the US dollar. This is eerily reminiscent of events just prior to the economic meltdown, when the krona began to sharply devalue before going into complete free-fall. At that time it was clear why it happened – there was, essentially, a run on the country as investors who saw what was coming scrambled to move their money out of Iceland. The reasons for the devaluation now are reportedly similar – wealthy folks moving their money out of Iceland in anticipation of what will likely be harsh conflict on the labour market early next year. This has, once again, given rise to discussion about the value of the krona as a currency, and whose needs it is actually serving. (Hint: it is not those of the proletariat.) After all, when a few people with fat bank accounts can make a dent in the economy of a nation, and thereby affect the welfare of all its citizens, something is definitely not right. If you would like to sign up for my monthly newsletter, please click here.